Maximize operational efficiency and make smarter decisions on your network to gain market share and become more customer-centric through Location Intelligence. Use spatial analytics to deliver the best and most profitable network possible using Location Intelligence. 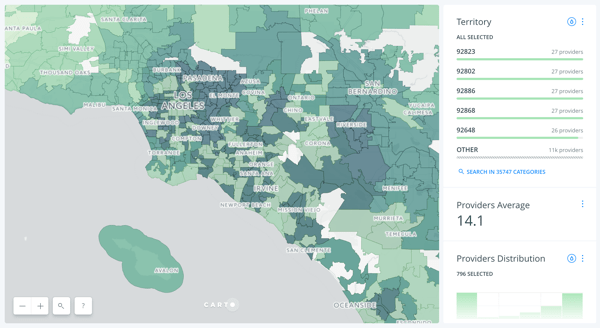 Whether it’s FTTH, 4G or UBB deployment, use your organization’s internal data and CARTO’s Data Observatory to increase ARPU, reduce churn and lead your market from the front. Utility companies want to use spatial analytics to understand energy usage in order to optimize their network operations and to know where to make future investments in infrastructure. With CARTO Builder and Engine, Utility companies are able to democratize the use of Location Intelligence in their organization - making geospatial available to more than a handful of GIS experts to drive key infrastructure decisions. Understand patterns and trends related to utility consumption and capacity. Get on top of infrastructure challenges, streamline outage management and plan maintenance and construction for maximum efficiency. Let CARTO boost your operational output through the power of location. Optimize your fleet’s performance, reducing costs and optimizing routing using Location Intelligence. Whether it’s tower maintenace, smart meter or WiFi installation - harness the power of CARTO to track your team, saving your organization valuable time and money. A range of logistics and waste disposal management companies want to optimize their operations by leveraging location data to reduce their operational costs. CARTO Engine has a series of advanced routing algorithms, enabling the creation of apps which bring together internal and external data to identify optimal routes and territories for your operations.